It's impossible to determine exactly what Yankees centerfielder Curtis Granderson and the Oriole Bird were discussing during pregame calisthenics. But, these stills taken from the Yes Network's dialogue-less video of the conversation seem to indicate some sort of deal was brokered. 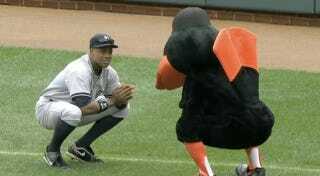 Whatever it was, though, it worked out for the Oriole Bird. His guys won 5-4 in 10 innings, with Granderson going 0-for-3 with a strikeout.